All models of cloud—IaaS, PaaS, SaaS—invoke a shift of responsibility away from IT departments toward data and application owners. 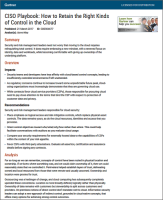 Where is the handoff point delineating security responsibilities between cloud providers and customers? Should we encrypt everything by default, or not? What does "dedicated" really mean in the cloud? Do location and residency have any real impact on data governance? This Gartner report is licensed by Dataguise for a limited time only. Access it now! We're sorry, but this report is no longer licensed for distribution by Dataguise.